Pullman, Wash. • Washington State’s Beasley Coliseum offers Pac-12 basketball teams an opportunity to relax and recover after the torment of visiting league-leading Washington. Utah produced an offensive cure and showed some defensive ability Saturday night in a 92-79 defeat of the Cougars. 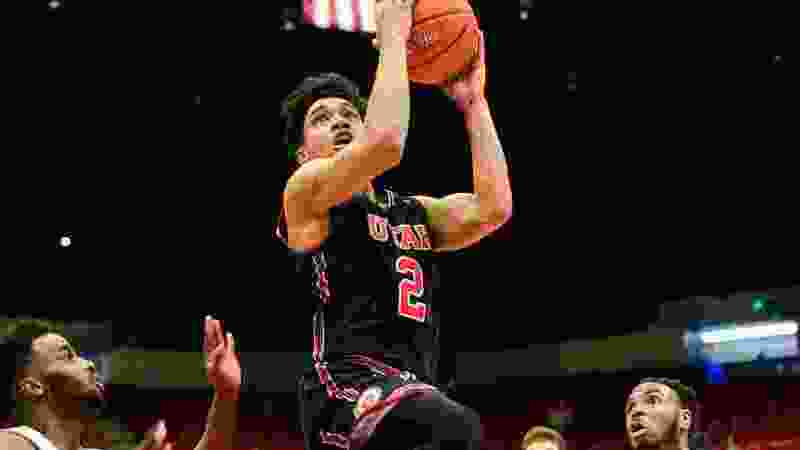 In the process, the Utes maintained their top-four standing in the conference and left Pullman with the breakthrough of sophomore forward Donnie Tillman’s rediscovering his game at both ends of the court. The Utes’ 45-point production in the first half was impressive, after they totaled 45 points in an ugly loss Wednesday at Washington. And what Utah (15-12, 9-6 Pac-12) did defensively in the second half was even more encouraging. Tillman took the lead role against WSU star Robert Franks, as the Utes held the Cougars to 36.7-percent shooting after halftime. Utah quickly built a 14-point lead as the second half began and never let WSU get within eight points after that. Senior guard Sedrick Barefield matched his season high with 33 points, overcoming the 29 points of Franks, who might be the Pac-12’s best offensive player. Barefield’s individual scoring honors were made possible by Tillman’s defensive effort, after Franks had scored 22 points to Barefield’s 19 in the first half. The result was a bounce-back game for the Utes, in multiple ways. Barefield had been shut out in the last 33 minutes at Washington after a hot start; Tillman went scoreless for the first time all season and was among many Utes who just were overwhelmed by the Huskies. Tillman’s 16-point, 11-rebound stat line against the Cougars tells only part of his story, in what Utah coach Larry Krystkowiak labeled a “crossroads” game for his team in the crazy competition for a top-four seed in the Pac-12 tournament. Krystkowiak’s move to a man-to-man defense succeeded in bringing something out of his players — especially Tillman, whose work was vital in the absence of forward Timmy Allen, due to a back injury. Tillman acknowledged afterward that his performance tends to “meander” from game to game and he’s “never really engaged” defensively. That changed Saturday, when he accepted the challenge of guarding Franks, knowing he was testing himself against a future NBA player. “It was fun,” Tillman said. • Utah scores 45 or more points in each half of a 92-79 win over Washington State, after being held to 45 points at Washington. • Sedrick Barefield (33) and Donnie Tillman (16) combine for 49 points, after going scoreless in the last 33 minutes Wednesday. • Utah (9-6) is alone in fourth place in the Pac-12 with three games remaining, starting with a trip to Colorado next Saturday. Franks had missed WSU’s 88-70 loss to Utah at the Huntsman Center in January with a hip injury. Without him, the Cougars scored only 30 points in that game’s first 26 minutes. Thanks partly to Franks’ 13 points, WSU needed only 14 minutes to top the 30-point mark Saturday, as his outside shooting exploited Utah’s zone. Eventually, the Cougars (11-16, 4-10) started missing shots and their own lack of defense accommodated Utah’s comeback. In a volatile first half, the Utes trailed by nine points and led by seven as Parker Van Dyke (17 points) supported Barefield. Utah’s 45-43 halftime lead seemed precarious, but the Utes pulled away with defense and 3-point shooting. Players moved the ball efficiently, Van Dyke hit consecutive 3-pointers and Utah continually had answers when the Cougars made any kind of threat. Barefield was exactly the player the Utes needed him to be, and the same could be said of a bunch of his teammates. “It’s that time of year, where you fall out or you can make a name for yourself,” Barefield said. By beating WSU, the Utes stayed afloat in their bid for a first-round bye in the Pac-12 tournament. They also made it through a Pac-12 road schedule without being swept on any two-game trip, and left themselves needing only one more victory to clinch a winning record in league play. That’s worth something, even in a downtrodden conference.